Caption slip reads: "Photographer: Brunk. Date: 1951-09-26. Reporter: Rose. Assignment: Meyer & Welch strike. 23, 24, 27, 28: L to R: Ed Clark, picket, released midnight on $1000 bond chats with Vernon Police Chief Ernest Giles (with baton). 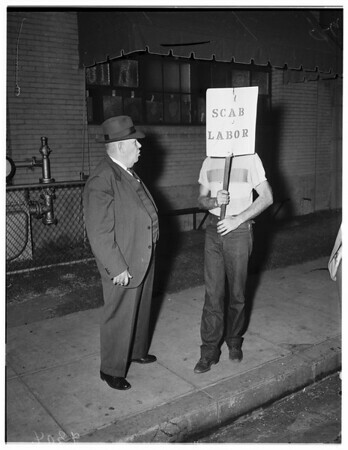 29: L to R: Daniel Carapoli, picket, chats with M & W plant guard, E.R. Telford".